Awaiting picture of the ECO Warriors due to new Data Protection laws. 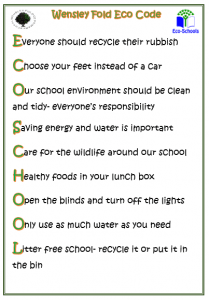 At Wensley Fold the ECO values are a fundamental aspect of our everyday school life. 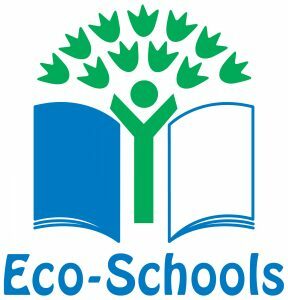 Throughout the school we endeavour to implement the ECO areas into the curriculum and give the children a broad range of learning across all 10 areas. We have an ECO warrior committee who regularly meet to discuss any issues or suggestions that have been raised. 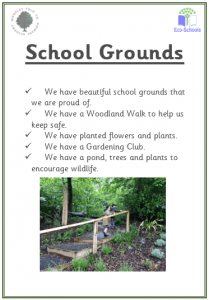 This year we focused our project work on 3 areas; litter, school grounds and transport. 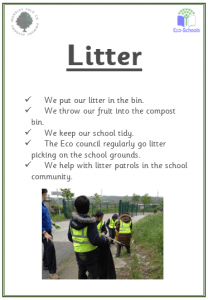 The children worked extremely hard in involving the community by litter picking in the local area and encouraging more children to walk to school to avoid the increasing number of cars around our school at peak times. The ECO Warriors organised their classes in improving different areas of our school grounds. Making it a more appealing and safe place for children, parents, the community and the wildlife that live here. The ECO Warriors monitored the changes that were implemented as a result of the environmental review that took place at the beginning of the year. The Green Flag is a prestigious award that that we have achieved as a result of the children’s hard work, dedication and commitment to ECO Schools. The 10 Eco Areas. What do we do? Have a look at the 10 areas of ECO! 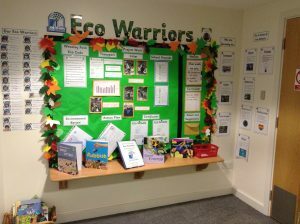 Our working ECO information board displayed at the front of school. Have a look and post any ECO related suggestions! 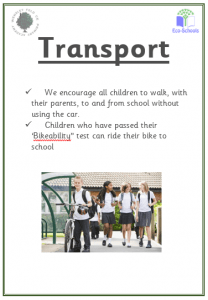 This year we are focusing on, school grounds, litter and transport. 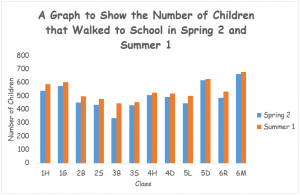 We are encouraging children to walk to school every day by having a walk to school competition throughout the whole school. 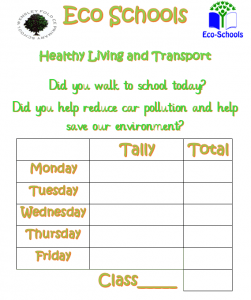 The class with the most children walking to school across the term will win the ECO Class of the Term!